In collaboration with Einar Guðmundsson we created the identity for Stockfish Film Festival 2015. We created the brand from scratch as the only existing element was the logo. 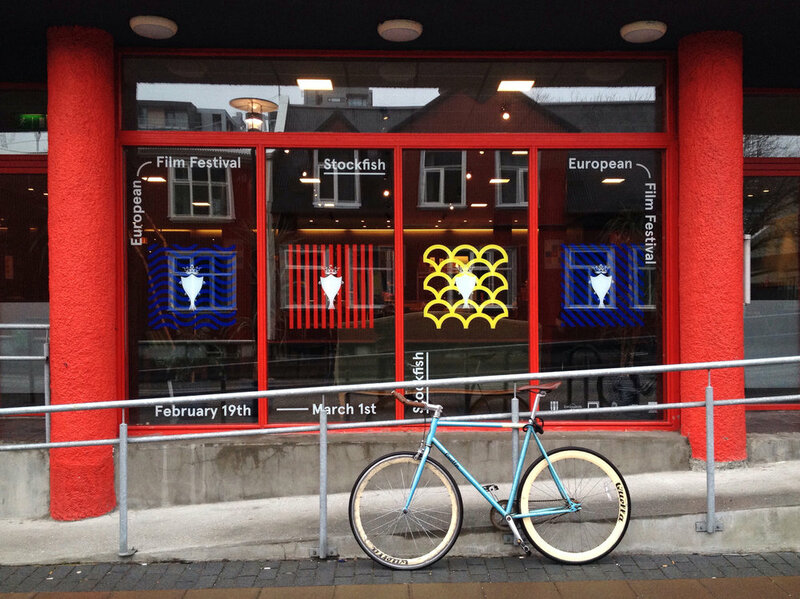 Stockfish European Film Festival in Reykjavík is an international festival that was held in Bíó Paradís, Reykjavík’s art-house cinema, and several other locations from February 19th – March 1st, 2015. The festival’s home is Bíó Paradís, Reykjavík’s only independent art-house cinema, located right in the heart of downtown Reykjavík. Bíó Paradís regularly screens the latest art-house releases, classic and cult films, documentaries, shorts and special children programs. Stockfish may be a new festival but it traces its ancestry to the year 1978, when Reykjavík Film Festival was first held. That festival was held regularly until the year 2001 but is now reborn under a new name. As the festival is being reborn under a new name we wanted the identity to be bright, fun and notable. We wanted it to be abstract and inspirational in context with the festival's theme. The illustrations represent different ideas that relate to Reykjavík and the film industry, such as camera elements and a film reel, fish skin, snow, waves, the corrugated iron from the houses outer walls, etc. The patterns amalgamate together to create a signal code, almost like a flag language for the festival itself. Red, blue and yellow colors on their screen mode, as a reference to the film industry.